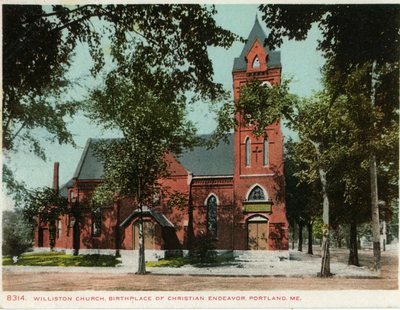 "Portland's Williston Church Postcard "
An image scanned from a postcard of the Williston Church in Portland, Maine. Text on the card identifies the building as "the birthplace of Christian Endeavor." The card was printed with the number 8314. No additional information or date appear on the back.